One of the great pleasures of playing golf in Land of Smiles is the availability of walking and having your own caddy. 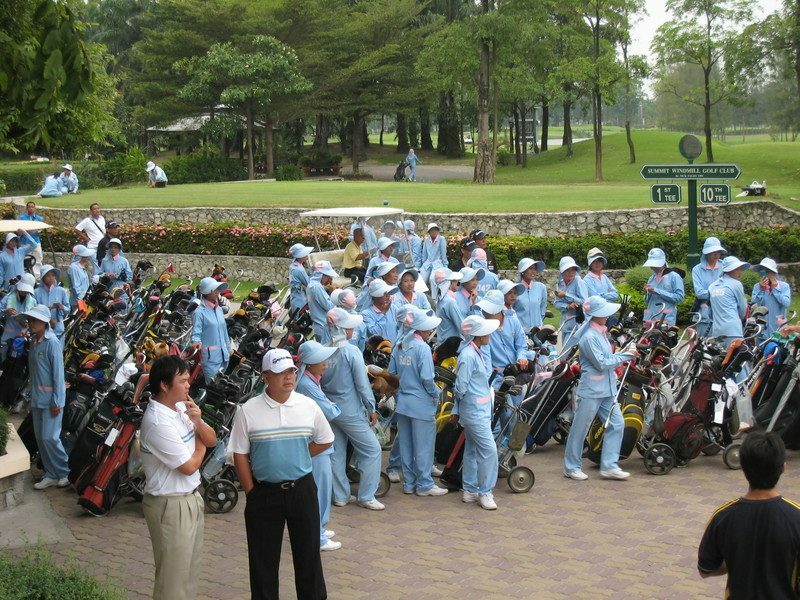 Having your own “assistant” to hand you water, clean your clubs, hold your umbrella, track your ball flight and “carry” (though virtually all caddies pull a cart nowadays) your clubs really enables golfers in Thailand to truly focus on their game. Often you can book a caddy that you have used previously, however there is no guarantee that she will be available when you arrive at the course. The more common option is to select a caddy when your car pulls up to the bag drop. You will be given the next caddies in the queue, but you can request one that speaks a bit of English. Thai golfers find that their caddies read greens pretty well. It is best to have her read your putts during the first couple of holes and you will confirm she is accurate and a great help. If you can develop a rapport with your caddy, golf in Thailand will be much more enjoyable. Personally I have been able to salvage a round by my caddy being able to settle me down and uttering the standard Thai phrase “mai pen rai” (interpreted as never mind, no problem). Try to get to know her if she speaks a bit of English. When dealing with caddies one must remember in Thailand that saving face is very important and getting angry is a sign of bad manners and really frowned upon by Thais, even if the anger is directed at yourself and not the caddy. So, try to keep this in mind when things go wrong. It is very, very important to drink lots of fluids before and during the round to prevent dehydration. When dehydrated, the body temperature rises, focus diminishes, and anger can surface quickly when your game starts to sour. If you find yourself getting upset about a round going in the wrong direction, try not to swear and slam clubs. Grit your teeth, take the opportunity to forget about your score and consider it purely a practice round. Try those shots that you are afraid to attempt when going for score. Drink plenty of water and in fact maybe even a beer or two will be enough to settle you down. And finally, DO NOT forget to tip your caddy………they work hard. Generally 300 Thai baht is appropriate for good service and 400-500 is a well appreciated above average amount for excellent service.